Who is happier about this hike? I think Jim probably is. 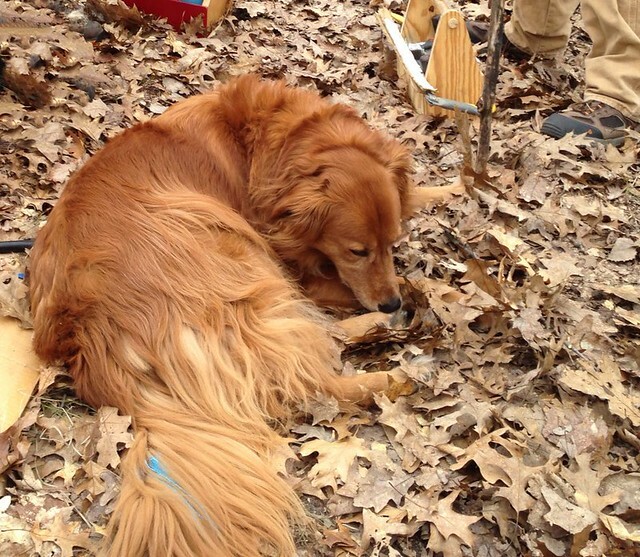 Kip though would enjoy himself though scampering through the woods when Jim was sure no one else was about. 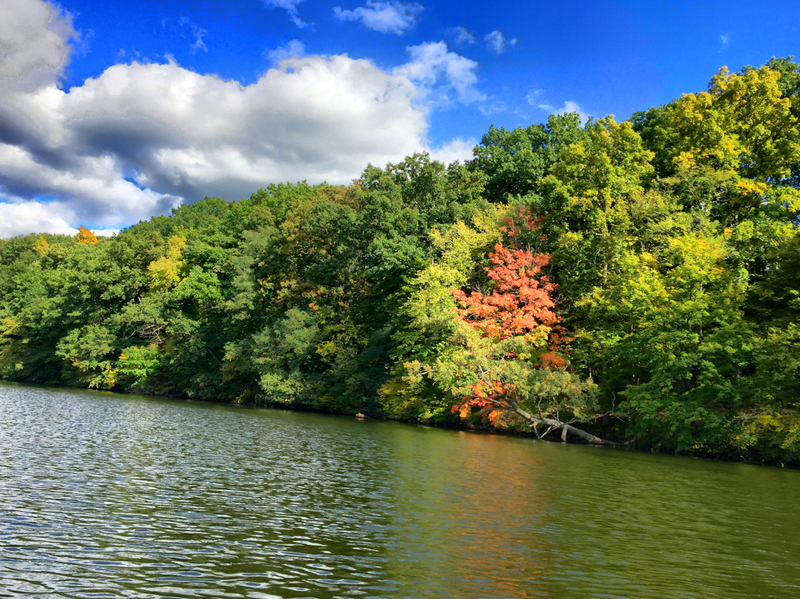 The Jordan River Pathway and North Country Trail form an 18-mile loop. 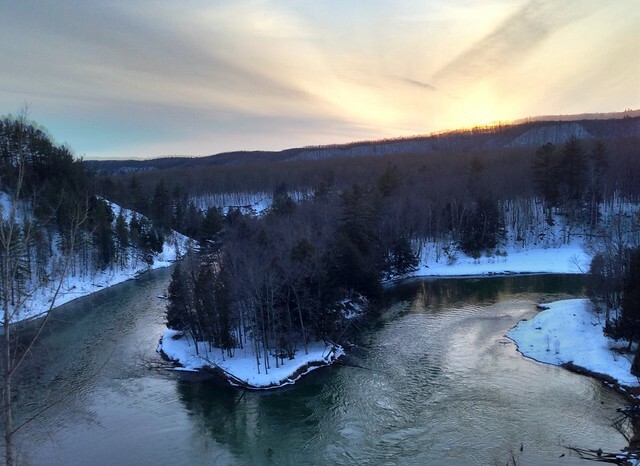 Located in the northwestern part of Michigan’s Lower Peninsula the Jordan River valley is perhaps a bit less well known than some other areas. I’ve actually not done this loop hike before. 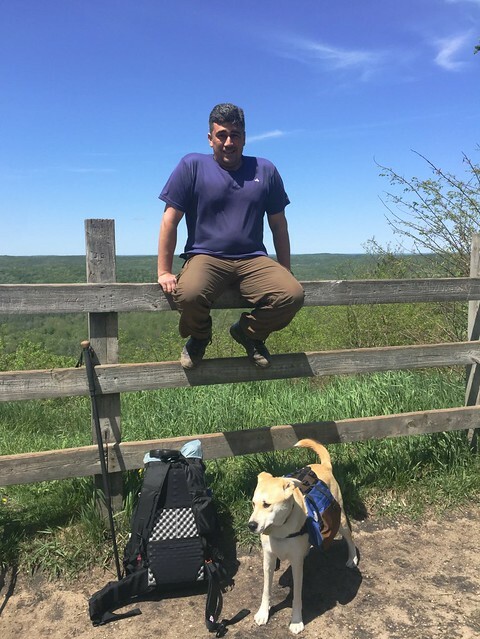 On May 31 and June 1, 2015 I joined Jim Walke and his dog Kip to backpack the loop. Like most people we decided to do the hike in the traditional counter-clockwise fashion starting at the overnight parking lot at Deadman’s Hill. But, I am getting ahead of myself - let’s start at the beginning…. There is a fair bit of information available about the Jordan River Pathway Loop. The JRP is maintained by the Jordan Valley 45° North North Country Trail Association Chapter. While some maps exist online for the area they are pretty meager affairs. You can get a rough sense of the area from this overall trail map (PDF file, page 2) and of the detour from this map. The map in Jim DuFresne’s Backpacking in Michigan book is decent and I expect the NCT map isn’t bad. We were stirring by 07:00 and it was a chilly morning. I suspect the nighttime low was closer to freezing than either Jim or I expected. In fact, I learned Jim had a chilly night. But with the sun shining down upon us we warmd up as we crossed the Jordan River expecting another fine day of hiking. Jordan River Pathway Overview Map page 1 of 2. Jordan River Pathway Overview Map page 2 of 2. The complete photo album for the hike can be found here on Flickr. Three times a year I join Andy Mytys and Joh Lawton and we drive west and north towards Lake Michigan to maintain a section of the North Country Trail (NCT). Our section runs about 6.5 miles from 13 Mile Road (north) to 16 Mile Road (south) in Newago County. You usually can find something different in any trail work session and this year was no exception. Finding the very hot remains of a campfire in an illegal campsite was the unfortunate standout this time (see video here). 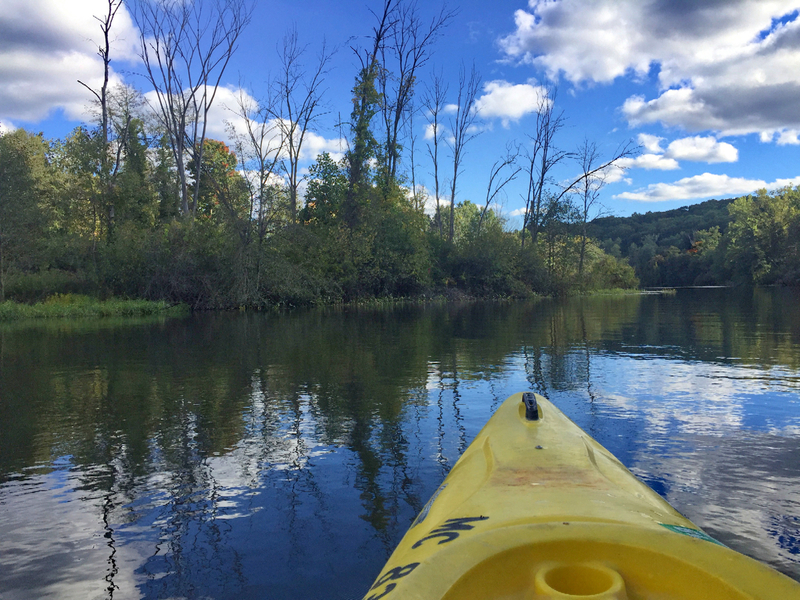 Learn more about the North Country Trail and Western Michigan NCTA Chapter. It has been a while since I've managed to go on any winter backpacking trips. In fact, it has been several years since I've actually done more than day hiking in the winter even if some of those trips were based out of rustic cabins in places like Wilderness State Park by Mackinaw City or the cabins in the Waterloo-Pinckney Recreation Area. So this two-night weekend spent hiking a portion of the Manistee River Trail with friends was a real treat. Joined by experienced, in some cases (maybe all), winter backpackers Doug, Ewa, and Paul (and Paul's dog Capone) we planned a fairly modest couple days of hiking in and then back out on the Manistee River Trail. 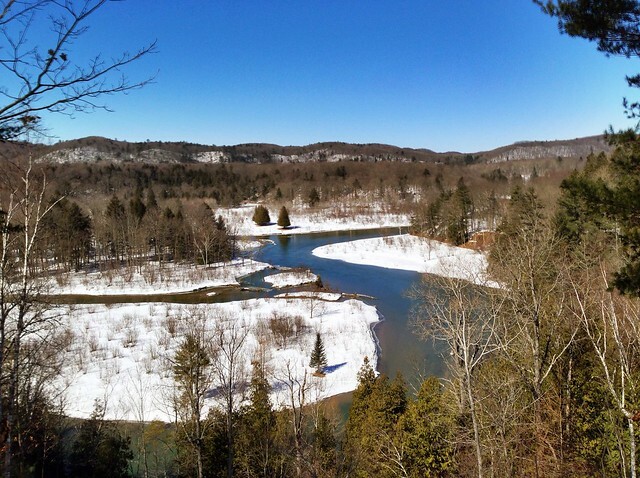 Their was a time when I had hiked the entire loop which includes the North Country Trail on the other side of the Manistee River covering about 21 miles over a weekend in snowshoes but this trip would be nowhere nearly that ambitious. Our plan was to drive to Red Bridge Friday night and either camp right there or somewhere nearby, hike however far on Saturday to some point along the trail, and return Sunday for the drive back to our respective homes. We would meet at Barski Bar in Baldwin and after dinner drive to Red Bridge to start our hiking weekend. I suspect that their aren't that many places to eat in Baldwin, Michigan. Barski's though has some truly wonderful food. I imagine the burger I had that was topped with an egg plus the more usual burger toppings would make a cardiologist cringee but boy was it tasty. The meals everyone else had create similar amounts of gastronomic pleasure and none of us worried much about the calories. After all, we were about to go on a winter hike. It would be well past sunset when we managed to park our two cars in the unplowed snowy parking lot at Red Bridge. We hoisted our packs, heavy with winter gear, grabbed our snowshoes and began the hike which starts with a quarter-mile tromp down North Coates Highway to where the MRT trailhead is. Once there we did a bit more gear re-arranging , stepped into our snowshoes, and began the slow process of hiking along the narrow snowy Manistee River Trail. We were in no rush to leave camp Saturday morning. While we all started to stir not long after sunrise we did not actually leave camp until about 11:00. We were only going to hike about 3 miles so leaving so late was hardly a hardship. When we left to hike the rolling hills it was overcast but nice enough. We made our way methodically along the trail enjoying the frequent views of the river as we crunched loudly through the snow. When we reached our planned, well the site Paul figured would be good mostly because it has such fine river views, around 14:00 (perhaps a bit earlier than that) we settled in for a fine lazy afternoon. The sun was out and that made setting up camp a much nicer though perhaps not really all that much quicker of a task. Of course, it was far too early to be done with our day so after dawdling about camp for a while we decided to hike to Slagle Creek. What a wonderful hike that turned out to be. Sure hiking down in and then out of a ravine along a slick hillside was a tiny bit of a chore but only a small annoyance. The sun had conquered the clouds that had been out earlier and it was a fine day to be out enjoying the trail. Settling down later to soak up some of that sun along the southwest facing ridge by our camp was also a real treat. The hike back to the cars was as enjoyable as the hike out. To be sure the day was actually somewhat colder but that hardly matters when you're tromping through snow that if you break through will rise well past your calf. We did break camp a bit more quickly but we still weren't in anything like a real hurry. We had ample time to hike out and some of us were lucky enough to spy various wildlife along the way including a couple bald eagles. We paused a few times for enjoyable breaks, usually in places at least a little out of the wind though still with views of the river down below. I think the biggest surprise though of our return hike came near its end. On the way out, seemingly farther along than it really was we had to squeeze by a juniper bush that was pushing well into the trail. On our left the trail vanished into a drop-off that seemed to drop easily 30 feet into blackness that likely concealed a lot of muck. Getting past that bush was something of a trial. When we came to it in the glare of a high sun it was far easier to edge past it and the drop off turned out to be at most 8 feet and nowhere near as imposing let alone dangerous. Hiking at night changes your perspective. We reached our cars a little after 14:00. Naturally we had to have a post-hike meal and so a return visit to Barski Bar was called for. I must say the rueben I had was even tastier than the burger of Friday night. Everyone else agreed their meals were equally good. After that fine meal it was time for Ewa and I to head back towards Ann Arbor while Paul and Doug returned to Grand Rapids. It had been a very good weekend indeed. On the weekend of April 11, 2014 Andy, Elwira, John and I went out to do our spring trail maintenance. 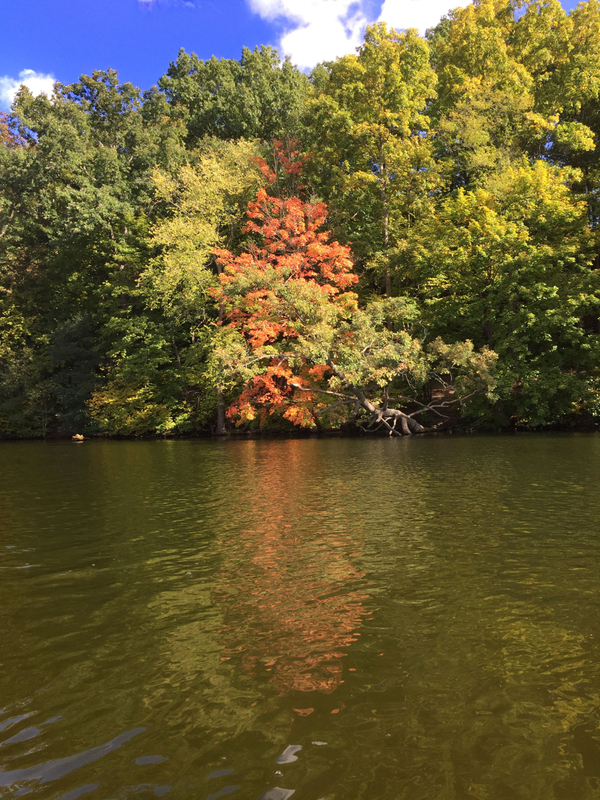 Our section of North Country Trail runs from 13 Mile Road to 16 Mile Road (Newago County, Michigan) and includes the side trail to Highbank Lake Campground. All told this is about 6.4 miles of trail that passes by several lakes rising and falling through many gentle short climbs. This weekend will be remembered for the great thunderstorm that ripped through the area Saturday night and Sunday morning. Besides the hail and very heavy flood causing rains the storm brought gale force winds that likely hit speeds around 60MPH and brought down numerous trees. Sadly I suspect the section of trail we had worked on Saturday likely has new trees down that we couldn't get back too. We certainly found downed trees that had not been there on the Highbank Lake campground side trail Sunday afternoon. Since we have a nearly four-hour drive to get to our section campsite located just south of Cedar Creek on FR 5311 not to mention the time we spend driving to places like 13 Mile Road and elsewhere we maintain a somewhat lengthier section than many to make all that travel time worthwhile - it just makes sense. Usually we have just one car so we have to do out-and-back hiking. While that does mean we can be certain our blazes are in great shape in both directions it does double the amount of hiking with our tools. Consequently we typically do our section in two pieces: 13 Mile Road to Highbank Lake campground the first day and 16 Miles to Highbank Lake the second day. Of course, before we can start working on the trail we must drive to the campsite and since we rarely seem to leave the Ann Arbor area before 6:00PM even when things are going smoothly we don't reach camp until rather late at night. This weekend would be no exception. It would, in fact, have a later start for several reasons all of which were outside our control and perhaps can be blamed for some troubles later in the weekend (well, OK that's likely a stretch). Even though we expected it to rain Saturday afternoon we didn't rush to get up and moving. After all, no one had gone to sleep before 1:00AM. But by mid-morning we were walking along the trail looking for things that needed to be dealt with. Surprisingly it turned out that we wouldn't have too much hard work to do. Plenty of small brush and a handful of blowdowns constituted the bulk of the work. A little bit of touch-up work on trail blazes, which is how Willow acquired that lovely blue tail, was done too. 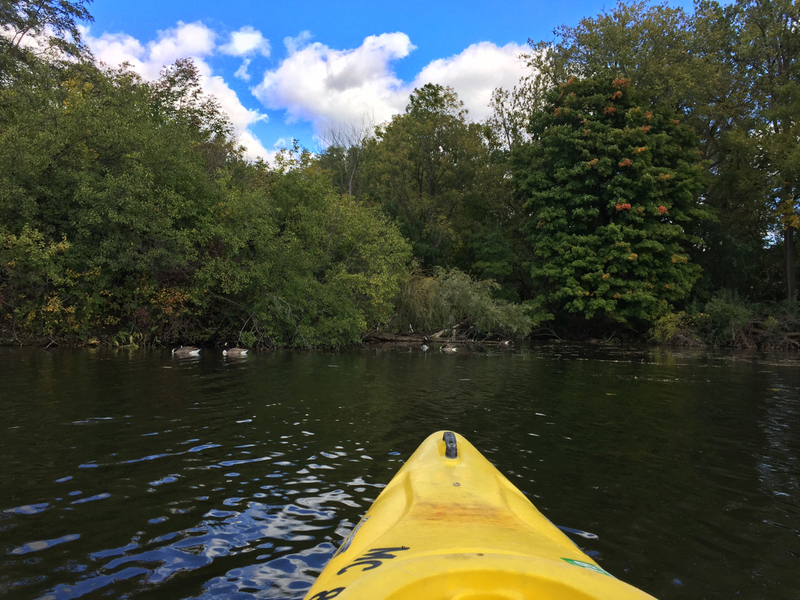 All in all as we passed by occasional patches of lingering snow as well as lakes that still had some ice floes bobbing about it was pretty easy work. The weather was holding off but we knew that couldn't last so after finishing off our late lunch at Highbank Lake Campground as a sporadic drizzle came down we put on our ponchos and headed back out. We planned to take a short cut which would use the forest service roads and a little cross-country hiking. I'm not sure how much of a short-cut it really ended up being but it certainly wasn't short enough. The storms we worried about started to pound us well before we reached the car. We had some confusion about where we were and the best way to go that may have slowed us up some but even had things gone perfectly I doubt we would've rreched the car before the downpour began. We poured our wet bodies into the car and drove into town for dinner rain falling hard all the way. One local, maybe he was a bit drunk, enthused loudly to the bar that the, "sky was falling." Certainly plenty of rain was and it would stop only briefly throughout the course of the next dozen or so hours. We returned to camp around 6:00PM and scurried into our respective shelters hoping the storm wouldn't last long. The rain stopped and the hail began. That was only the beginning of the extremely lousy, and potentially quite dangerous, weather we would be treated to all night long. You can only stay in your shelter so long. That length of time diminishes when you feel you aren't sleeping well. So while John and Andy snored on I was moving about not long after sunrise. Elwira and Willow joined me soon after. The storms had finally abated and we quickly learned that the damage left behind was extensive. Trees had been brought down all over the place; Cedar Creek had flooded; drainage ditches on the forest service road were flooded. I've no doubt that trees are down and blocking the trail we had walked Saturday. Talk about bad timing. We found extensive blowdowns on the section of trail between 16 Mile road and Highbank Lake too as well as bonus blowdowns on the campground side trail. As you can see doing trail maintenance can have its ups and downs. While you likely won't experience severe weather like we encountered during our weekend all that often it certainly can add a bit of spice to a weekend's worth of work. 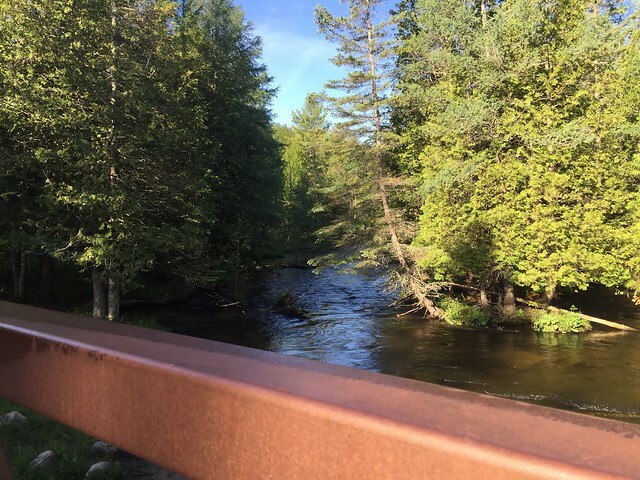 Even if you do not have a long distance trail like the North Country Trail near you chances are you have some trails near by that can use your help. If you do have a stretch of NCT nearby and want to learn more you can start by visiting the official webiste at northcountrytrail.org. A Note about the audio: I am experimenting with a new external microphone for the iPhone. It's a Zoom IQ5 stereo microphone and the results are proving interesting. I don't quite understand why one channel is picking up my voice so much more robustly than the other but that seems to be happening. Perhaps I just need to learn the ins and outs of the microphone. It certainly has better fidelity than the little iRig Miccast I used before. On a crisp overcast late autumn morning I joined many others to help do some trail maintenance on the North Country Trail. The Spirit of the Woods had a big morning planned and since our Great Lakes Hikes annual gathering was happening nearby some of us decided to join them on their project. They also had volunteers from the Ferris State Outdoor Club helping out. The project was to rebuild boardwalk that had been wrecked in a massive treefall and to improve nearby trail making it accessible to people in wheelchairs too. That meant widening existing trail in some places and smoothing it out everywhere. For 3 hours, which seeemed to be the length of the entire project, everyone worked at various tasks and quite a bit seemed to get done. I'm sure the organizers were happy with the results. I know we felt good about the work. That's one big reason why people do this type of thing. To help improve something that others will use and know you have had a tangible effect on the thing in question: that you made a difference. This little video should give you an idea of what it can be like to help in such a project and perhaps you will want to take part in similar projects in your local (or not so local) area. You can find the photos you saw in the video (along with captions) in this photo album. 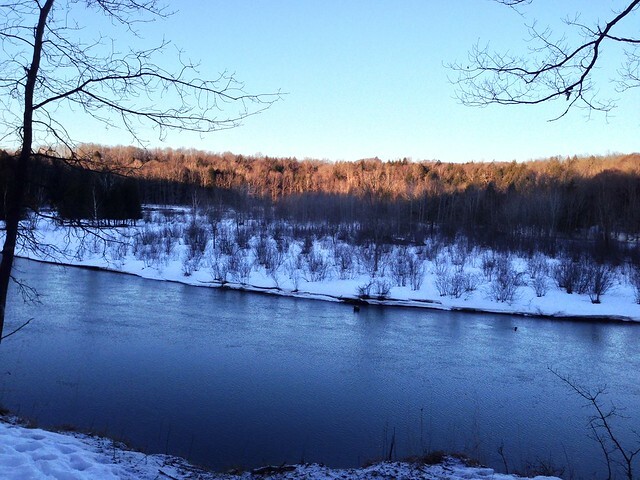 You can learn more about the North Country Trail at the trail's Official web site. A version of this video can also be found on YouTube. Along with my parent I joined 10 other people for a two week long trip to Peru and Ecuador. This would be our first Overseas Adventure Travel (OAT) trip. It would prove to be quite an interesting and informative experience overall. It is best to think of this as really two trips rolled into one. The first week we spent in Peru traveling mostly through the Sacred Valley with a key highlight being our overnight visit to Machu Picchu. The second week was spent in Ecuador and the key component there was our 4 days spent sailing amongst the Galapagos Islands. OAT trips, at least this one, have a goal of "learning and discovery" and one result of that is you move much more slowly than we are used to doing either by ourselves or with groups such as we travel with when on HF Holiday hiking trips. While an OAT trip can have physical challenges such as dealing with high altitude conditions, Machu Picchu sits at about 8,000 feet and Cusco at just over 11,000 feet above sea level or sea sickness on the 16-passenger catamaran the actual physical endeavors are modest. But you will still experience quite a lot even though at times you may feel both rushed or stuck in place depending on circumstances. 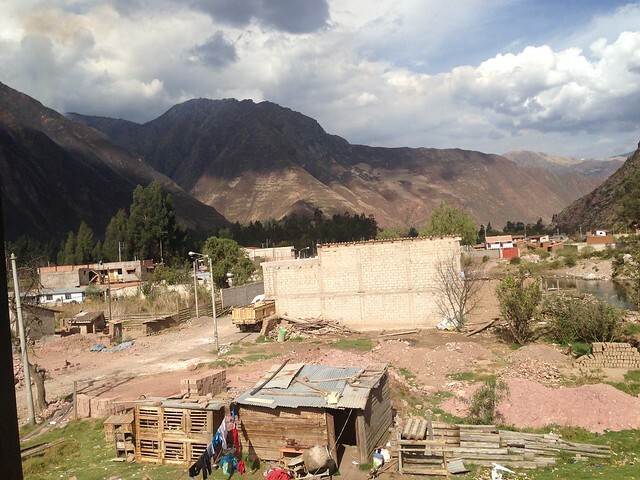 We spent about a week touring the region known as the Sacred Valley. 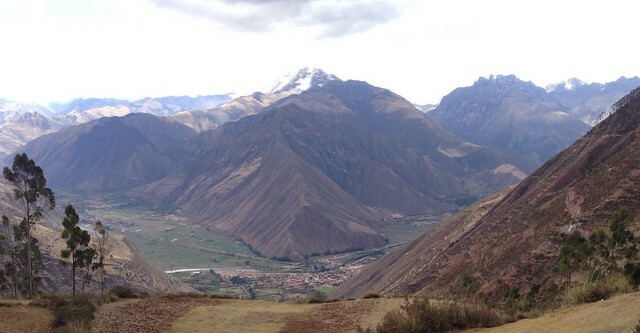 This is the very high alpine valley region that used to be the key region of the Inca Empire. 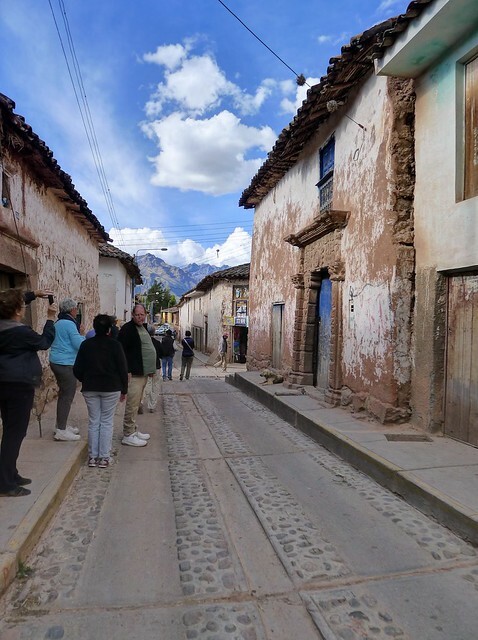 While people go to the Sacred Valley to experience the antiquities their is much more to the region than just the ruins of past civilizations. A big part of an Overseas Adventure Travel trip is learning about the people that live in the place you're visiting. In this segment we'll take a quick look at what we discovered. You can find more on the A Wanderingknight Blog. Photos can be found at the Flickr Photo Album. At 12,000 feet above sea level the mountains seem a bit barren. However, agriculture is practiced anywhere it can be even more. The soil looks rich and the farmers are growing several types of plants (corn, squash, and some sort of bean I think) but it's clearly hard communal work. 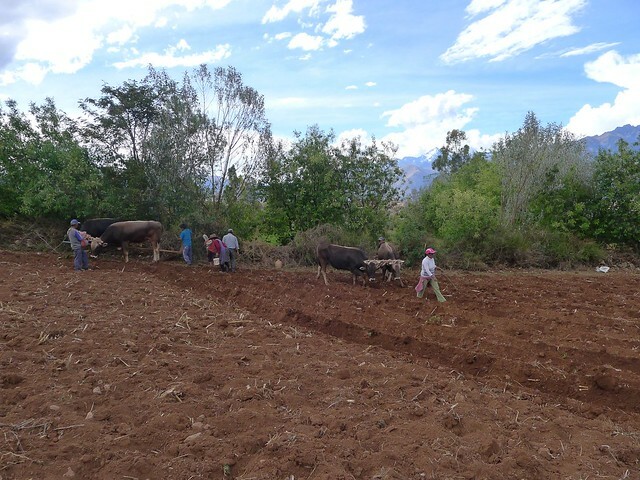 The bulls pull simple plows made of a local, maybe eucalyptus, wood; people direct the bulls; others place seeds in the furrows; and, still there is work for more. And yet they were happy to see us perhaps just because we represent a break in the day. Near the village of Chinchero we stopped at at co-op based weavers business. The weavers here are all women but from what I learned days later in a textile shop/museum in Cusco both genders learn to weave though perhaps the men general don't do it as a job (they do to attract attention). This work reminded me a bit of what we saw in Turkey. 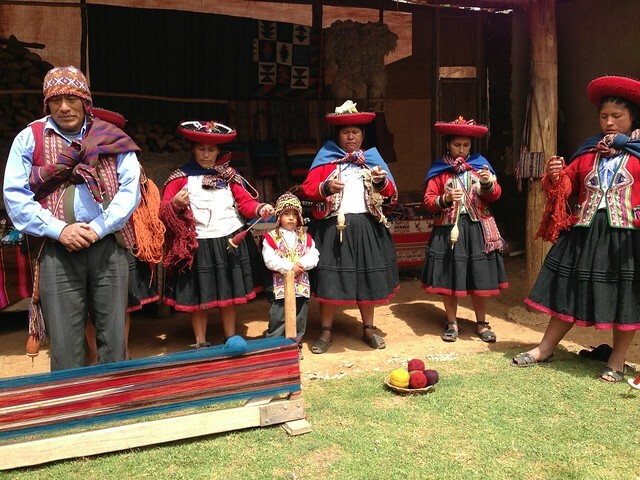 Here they work with llama or alpaca fibers and as you can see from their clothing it can be quite intricate. All materials are natural. Dad got a chance to dye some yarn. Perhaps Pavel, our trip leader who is from the Cosco region, told us what this statue is all about but I don't recall now. It is a stunning setting though. From the roof of the fair sized house we had lunch in. It's true this home with its nice courtyard is home to a good sized family who definitely share close quarters but it is a big step up from many of the shacks you see here. We walked around this little village for a time. It was rather quiet. Some people were out preparing for an event but other than that it felt rather empty. While each portion of cuy (pronounce, "cu-ee") was tiny just some skin and a small bite or two of meat I think it is fair to say that this guinea pig was the star attraction of the home cooked meal. 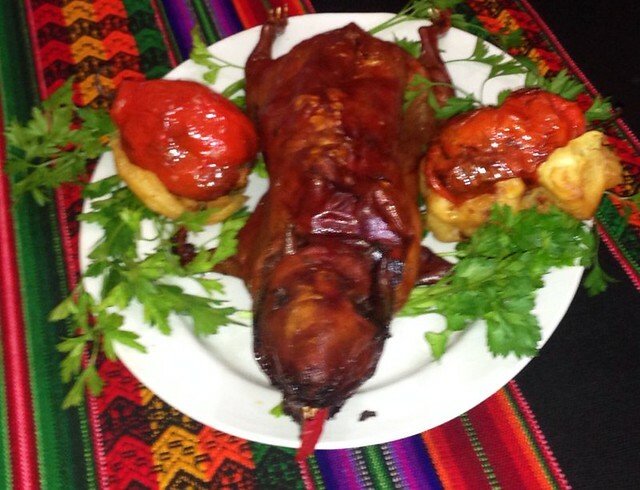 Cuy is considered something of a special treat and I think everyone enjoyed it. Some of us the previous night watched the lady of the house slaughter and butcher this cut so we had seen it go from alive to lunch. The other food included a tasty soup, stuffed peppers, potatoes, and some other things I'm no doubt forgetting. A lovely fine lunch and hosted by a friendly family with some very exuberant children. 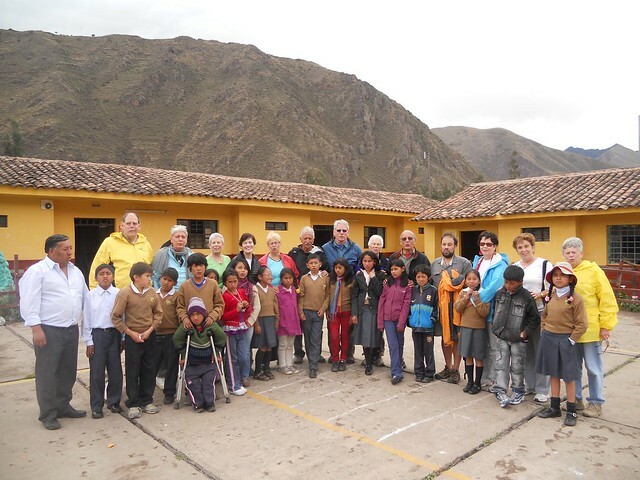 Our group and the fifth grade class we visited for a time. One thing Overseas Adventure Travel does is support organizations with financial assistance. In this case a school in Urabamba. While the children seemed enthusiastic it is clear the facilities they have need improvement. That can be said of so much in the region. Infrastructure from basic plumbing to reliable power is far from what it should be. Using a variety of natural materials to paint designs into the ceramics seems to be entirely done by the ladies who work at Seminario Ceramics studio (the men do the shaping of the clay). 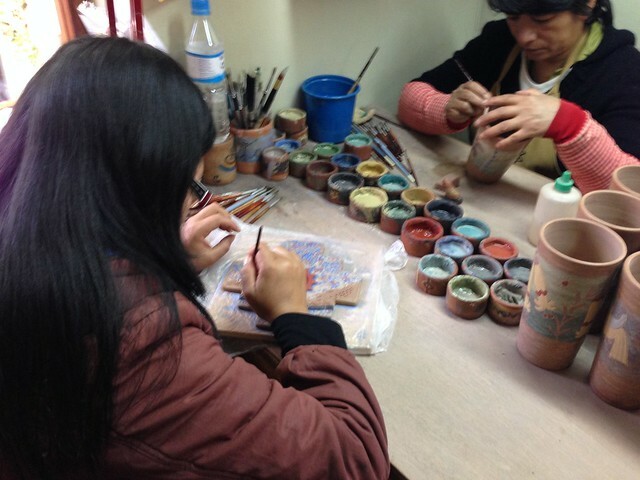 This studio is run be renown ceramicists and must surely represent part of the peak of artistry in the region. 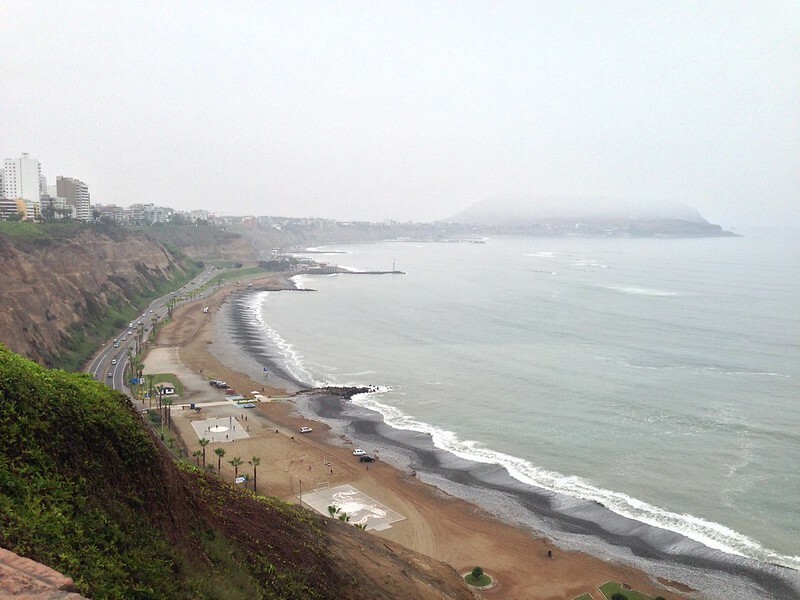 First we would spent a day in Lima, Peru. Lima is a bustling city and rather large with correspondingly maddeningly slow yet hectic traffic. It seems to take well over a half hour to get from anywhere to anywhere. Our hotel was located in the Miraflores district which is a posh area of the city quite different in feel from the heart of the downtown where central government buildings and the like are. We spent a very interesting bit of time at the archeological museum which held artifacts of ceramic and tapestries some of which are pushing 3,000 years old. 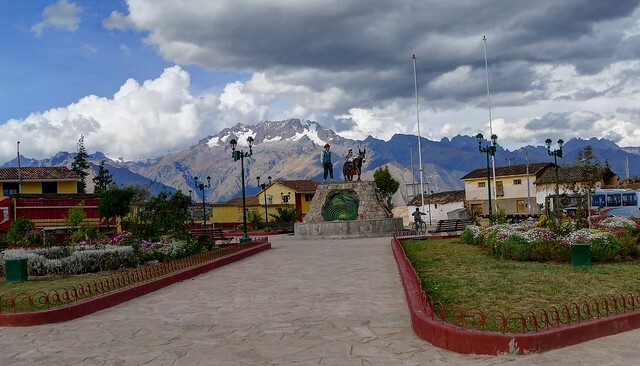 It is a compelling reminder that civilizations thrived in this area for a considerable length of time and that the Inca Empire was only a tiny, admittedly very impressive, capstone to the history of the area before the conquest by the Spanish lead by Pizzaro in 1532. Visiting the convent (monastery maybe; I'm not sure - Pavel and the local guide Elisa - I think that's her name - said "convent" but I'm not sure that's what they meant) where lengthy lines of people waited to enter for a months saints day service (Saint Anthony I think) was striking. These were routine services but clearly important. I think we were struck more by this than the throngs in a central square that were watching the Michael Jackson impersonations concert going on just a couple blocks away. Our hotel is located in the Miraflores district of Lima. Just a couple of block away built into the cliffs that drop down to the Pacific ocean is a pedestrian shopping mall. It's a pretty posh seeming place though when we walked through it just after 9:00 AM on Saturday it was pretty much empty. When we walked some of the streets later in the day things were definitely busier in this area. 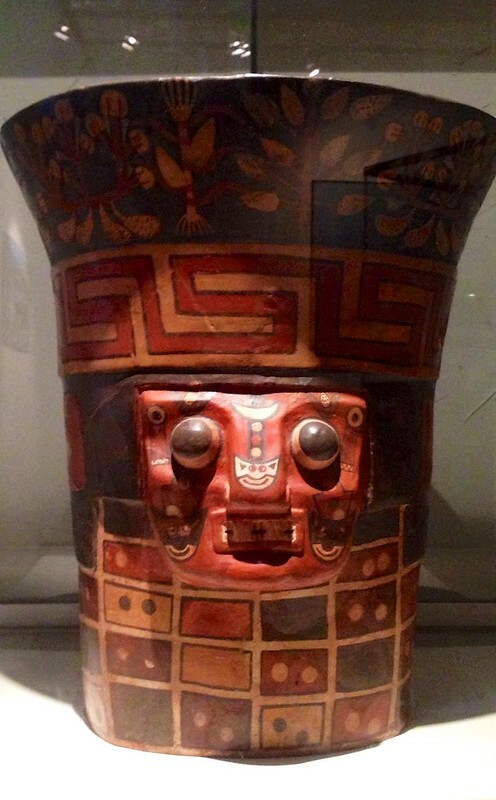 We visited the archeological museum in Lima. To get anywhere from our hotel it seemed to take easily 30 minutes by minibus. I am not sure if that says more about traffic congestion, though traffic did seem heavy, or how spread out Lima is. The museum is home to numerous artifacts including tapestries and ceramics (like this). Some of the artifacts are 3,000 years old. Seeing the works of cultures that predate the Inca who really are just the last one and only present for a very short time is impressive. We visited the heart of Lima and in this square found a Michael Jackson impersonation concert going on. Perhaps some protests too. But the real big deal here was at a monastery (I think) that was running constant services for a saint. I think it may have been Saint Anthony and this type of thing happens every month. The lines of people for what must be a regular and routine yet important service is remarkable. Over Memorial Day Weekend (May 24-27, 2013) the Western Michigan Chapter of the North Country Trail Association runs a trip to backpack the Lakeshore Trail in Pictured Rocks National Lakeshore. this year 5 of us did the trip. This year we hiked the trail from west to east, Munising to Grand Marais, the opposite of what we normally do. The trip would treat us to exceptional weather never getting overly warm and though nighttime low temperatures dipped to around freezing we were all prepared for that degree of chill. Of even greater importance to us was the near utter lack of bugs to pester us. That was a real special treat since sometimes when we have done this trip the bugs have been exceptionally voracious. We also got a couple surprises along the way not the least of which would be our chance, after years of merely seeing the light station from the ground, to tour Au Sable Lighthouse on our third day. Trip photos can be found here. A quick video glimpse of our hike can be watched here on Vimeo. I have only just realized that I never shared my experiences of Hollerfest 2012 with you. This was a fine festival and it seemed to me well attended. Hollerfest takes place at the Frog Holler farm and you can learn more about the festival at the hollerfest.com website. I managed to catch quite a few acts and was happy to see the wide assortment of musical style represented at the festival. I hope you enjoy listening to this audio postcard.